Are you the sort of girl who loves getting her nails done? I'm not. In fact, the last time I got my nails done was back in February of this year. I know, crazy right? Thing is, I hate the smell of nail polish and also, as a green beauty blogger, know that nail polish can never be all natural. At least, not if you're looking for a diverse set of colors. That said, you can come close, and I particularly love using Pacifica's 7-free nail polish. They're free from 7 toxic chemicals typically found in most nail polishes, such as parabens, phthalates (dibutyl phthalate), toluene, xylene, camphor, formaldehyde, resin, and animals. They also come with a vegan brush and are completely cruelty-free. While that's all said and good, the second reason I don't like doing my nails is because it's wasteful. And you know exactly what I'm referring to: Cotton balls. Every time I want to take nail polish off, I have to worry about wasting cotton balls, which just wind up heading straight to a landfill. To manufacture cotton, they use a heck of a lot of pesticides (cotton uses 20 percent of the worlds pesticides and herbicides to be exact). So yeah, not exactly the most non-toxic plant. Not to mention, cotton balls aren't recyclable, which is why they get dumped straight into trash after one single use. After learning about the zero waste movement, I was determined to change that. At first, I thought the best solution was just to stop using nail polish of any kind. That would make it easy to avoid cotton balls completely (no nail polish + no nail polish remover = no cotton balls wasted). While that probably is the best option, I didn't exactly want to waste the nail polishes (I only have 4, mind you) that I already have. Plus, the occasional manicure is pretty nice. So what was my second best option? Find a way to replace the cotton balls of course. This is where The Little Flower comes in. I've reviewed The Little Flower's products on here before (The Etsy shop sells a slew of hand-made cloth items, one of them being cloth pads), so I certainly trust the brand. The owner, Mary, was generous enough to send me some of her reusable cotton balls. They're made with cotton flannel outside and stuffed with high quality poly-fill. I even got to choose what color I wanted (clearly, I went with pink, cause I'm a girly girl like that). They're literally perfect replacements for wasteful, single-use cotton balls. Want to see why? Keep reading. Why you want it: Single-use cotton balls are one night stands, but these? They're marriage material. My review: With conventional cotton balls, you pretty much need a whole slew of them to make them last. Sometimes, I would need at least two to four cotton balls just to remove my nail polish (in the past), depending on how stubborn the polish was being. Not with these! I literally only need one to do the job when it comes to removing nail polish. Since they're made from cotton flannel and poly-fill, they're quite durable and can take a lot of rubbing. I also loved how I was able to tell Mary, The Little Flower Shop's owner, what color I wanted these reusable cotton balls to be. It gave it a much more personable touch and made me want to use them more (because they're adorbs). To test them out, I painted only one of my hands and let it dry for about 5 to 10 minutes. Then, I took one of these cuties and put some nail polish remover on it. Essentially that means I just placed it on the opening of the nail polish remover bottle and flipped the bottle upside down twice so a little would get on the cotton ball. Then, just like with a conventional cotton ball, I started to rub the nail polish off. Presto! It came off. It didn't take abnormally long either and didn't get all messy and gross like a typical cotton ball does. You know when you're using a cotton ball to wipe off nail polish and it starts to flatten and gets super drenched in the nail polish remover? That was not the case with this little guy. It remained the same shape and didn't feel super soaked, which actually made it easier to remove my nail polish. The one down side to all this is that when I tried to get the nail polish out of the reusable cotton ball, it didn't budge. I washed it in the sink using some all-natural detergent (my favorite is from the Simply Co.), but the nail polish was very resistant to coming out. That said, nail polish (no matter how natural) can never be all-natural, and does use a lot of chemicals. So I'm not surprised if it takes a few washes to fully come out (or, simply a stronger detergent). I don't think the stain itself will effect it's usefulness in getting rid of other nail polish I want to remove though, so I'm sure it's not a big deal. Besides, I have more than just one of these handy little cotton balls: I've got 10. I could always just use another if I want to avoid the stain entirely. With that said, I also used another of these reusable cotton balls to wipe off the makeup on my face, and that worked equally as well. I figured I'd try it for the heck of it, just to see how it would hold up. I dipped the reusable cotton ball into coconut oil twice and then started to wipe the makeup off my face. I didn't need to triple dip or anything: Just one time was enough to get all my makeup off, including eye makeup. Pretty impressive huh? I'd say these little guys are quite the multi-taskers. I highly recommend you get yourself some ASAP. My nail polishes are almost all from Pacifica and were bought about one year ago. One of them is from Poofy Organics (it's a light pink color) and is the only one that's not from Pacifica. Both of these brands are really great and don't contain any toxins. Poofy Organics nail polishes are free from 11 different toxins, such as formaldehyde, toluene, DBP, formaldehyde resin, TPHP, camphor, xylene, parabens, fragrances, phthalates, and animal ingredients. The Poofy Organics color I have is called Never Too Late and it's a really cute pink color. The Pacifica polishes I have are Turquoise Tiara (the blue color), Blushing Bunnies (the pink color), and Red Red Wine (the red color). They're 7-free polishes, meaning they're free from parabens, phthalates (dibutyl phthalate), toluene, xylene, camphor, formaldehyde, resin, and animal ingredients. Both are really great brands, but I do favor the consistency of Pacifica's polishes a bit more. Also, on a side note, the actual bag that I got for holding my nail polishes is from a store called East Meets West. 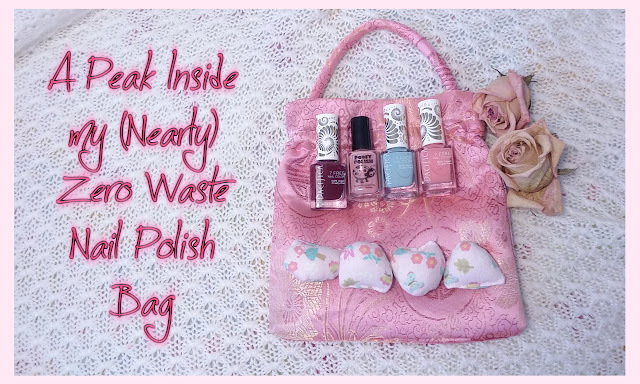 I was on a mission to find a really cute bag to put all my reusable cotton balls and nail polishes into and kind of just stumbled upon this one. While it's certainly not vegan (it's made out of silk), it is really adorable. Also, I got it at a bargain: The store was selling it for cheap because they were trying to get rid of it. In other words, if I hadn't bought it, it probably would've just ended up in a landfill. Glad I could give it a second life. Besides, the handle makes it super convenient to carry around with me, and also lets me hang it from my decorative wall hangers (they're shaped like owls, so double the cute). If you're wondering what I used to remove my nail polish, don't get your hopes up. I tried using some natural stuff (witch hazel and apple cider vinegar included), but nothing worked. Unfortunately, I needed to use nasty, conventional nail polish remover to get my nail polish off. Ick, I know. I just used a little bit of my mom's and tried not to gag at the smell. I think the next step for me is to either make my own all-natural nail polish remover (that will actually work effectively), or look into pre-made ones. Because honestly, that's the one thing that's still not completely zero waste or all-natural in my nail polish bag. Most conventional nail polish removers not only have a bunch of toxins, but they also come in plastic (double gag). Sure, recycling the bottle is okay, but I like to avoid recycling as much as possible. What do you use to remove your nail polish? Do you have a homemade, DIY recipe you use and would like to share? Or, do you know about an all-natural nail polish remover that's packaged in something other than plastic? I'd love to hear from you in the comments section. I'm definitely open to suggestions. I saw a nail polish remover Poofy Organics sells that's toxin free and comes in a glass bottle, so that might be my best bet. If I can't find anything better, I'll just wind up purchasing that. Either way, I will do more research into this and see how I can - ahem - *greenify* my nail polish remover too, so to speak. I've worked with The Little Flower Shop founder, Mary, before and her work never fails to impress me. She was so easy to talk to and sent my samples out right away! 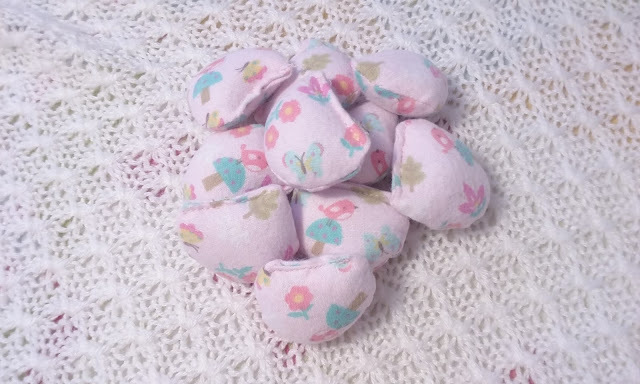 I love how I was able to customize my cotton balls (I requested pink ones and certainly got what I wanted - and you can request different colors too!). When I received my samples, they came in a recyclable/compostable paper envelope (super ecofriendly!). I love how these cotton balls are reusable and made from washable fabric. Talk about a zero waste win! These are great for removing nail polish, but they are also great for removing makeup (so two in one!). I absolutely love these reusable cotton balls and will continue to use them for a long time - they seem very durable! I love how simple the materials in these cotton balls are - just cotton flannel and poly-fill. While I don't give myself manicures very often, I'm glad that I won't be wasting anymore cotton balls when I do decide to indulge. These products worked great - they truly got off the nail polish (and makeup) just like a conventional cotton ball would do. Using these products seriously minimizes the amount of waste I put into the environment. Do you know how many conventional cotton balls are in one bag? These little guys will save you money in the long run - a lot, to be honest. An average bag of cotton balls costs anywhere from $1 to $6, and if you use them a lot, that adds up. Having to pay $8.50 for a purchase that will last for years to come is such a better options. 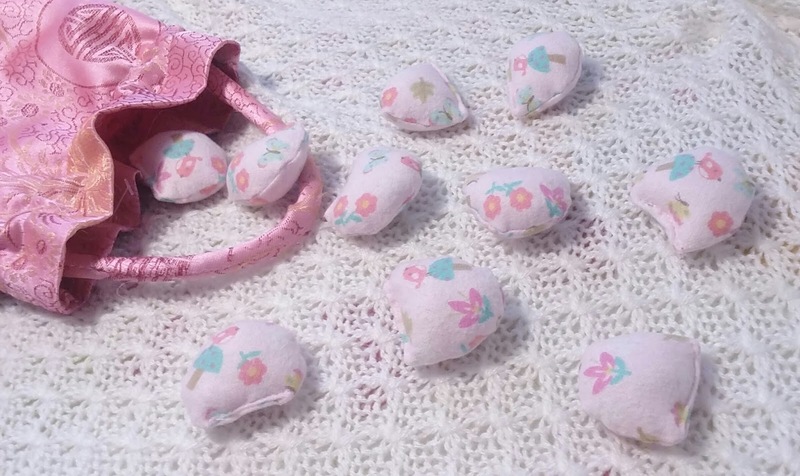 The Little Flower doesn't just sell the cotton balls I reviewed: They also sell cloth pads (which I've reviewed in the past too), baby blankets, baby accessories, bath accessories (cotton balls are one of them) and cloth tote bags (all handmade out of cloth). Pretty versatile if you ask me. The cons: The cons are very low. If I ever decide to get my nails done outside of the house, I can't exactly take these with me. I mean, I could, but it might be considered a sanitary issue if I ask the nail artist to use my reusable cotton balls. I wasn't able to get out the stain of the reusable cotton ball I used for removing my nail polish. Maybe I'd be able to if I plopped them into the machine wash, but I washed them by hand in the sink. I think that's probably because nail polish is just (in general) harder to remove than your typical stain (and not because my Simply Co. Detergent is ineffective). With that said, it's still good to use again, stain and all. I wish I had an all-natural, zero waste nail polish remover to couple this zero waste win. That said, that's not necessarily a con directed towards the reusable cotton balls itself - more so an overall con that I want to find a solution to. Conclusion: If you love doing your nails but hate wasting cotton balls, these are for you. To me, there's no better zero waste way to do your nails. Plus, these cuties can be used to take off makeup (so they're doubly versatile). Since they're machine washable, they're built to last and can be added to your laundry without a hitch. If you'd like to get your own, I highly suggest talking to Mary about it. She will help you customize it to your liking and answer any questions you might have about proper care and use. Plus, Mary in general is such a sweetheart to work with. Also, lets not forget this one-time purchase will save you a lot of money in the long run. For example, lets say you bought one pack of cotton balls per month, and it cost you $5 each time. You'd be spending $60 a year on freaking cotton balls! That $60 could go to something you love - a nice dinner out, a movie, or a game. Even if the bag of cotton balls costs $1 a month, that's still $12 out of your pocket every year. That's $3.50 more out of your pocket than what these reusable cotton balls would cost you. So if you'd rather not give up your monthly manicures (but don't want to further harm your wallet or the environment), these reusable cotton balls are must-haves.